A Companion to Mill (Wiley-Blackwell, 2017). Co-edited with Dale E. Miller, with contributions from (amongst others) John Skorupski, Dan Jacobson, Elijah Millgram, Richard Reeves, Wendy Donner, Jonathan Riley, Henry West, and David Brink. 'Mill on the Liberty of Thought and Discussion,' in A. Stone and F. Schauer (eds.) The Oxford Handbook of the Freedom of Speech (Oxford University Press, forthcoming). 'Historicizing Naturalism: Mill and Comte,' in J. Shand (ed.) A Companion to Nineteenth Century Philosophy (Wiley-Blackwell, 2019), 140-59. 'Mill on the Primacy of Practical Reason,' Analysis (2018) 78(4): 630–638. 'Mill on History,' in C. Macleod and D.E. Miller (eds.) 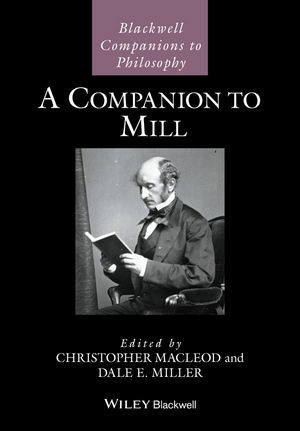 A Companion to Mill (Wiley-Blackwell, 2017), 266-278. 'Mill's Antirealism,' Philosophical Quarterly (2016) 66 (263): 261-279. 'Mill on the epistemology of reasons: a comparison with Kant,' in A. Loizides (ed.) Mill’s System of Logic, (Routledge, 2014), 151-169. 'The Roots of Romantic Cognitivism,' European Romantic Review (2014) 25(4): 403-422. 'Mill, Intuitions, and Normativity,' Utilitas (2013) 25(1): 46-65. 'Was Mill a Non-Cognitivist?' Southern Journal of Philosophy (2013) 51(2): 206-223. Encyclopaedia Entries, Public Philosophy, etc. 'Footnotes to Plato: John Stuart Mill,' Times Literary Supplement Online, February 2018. 'J.S. Mill', in J. Timmermann and S. Golob (eds.) Cambridge History of Moral Philosophy (Cambridge University Press, 2017), 436-47. 'John Stuart Mill', in E. Zalta (ed.) Stanford Encyclopedia of Philosophy, Fall 2016 edition. 'Genocide,' in M. Gibbons (ed.) The Encyclopedia of Political Thought, (Wiley-Blackwell, 2014), 1464-1475. John Stuart Mill and the Art of Life. Ed. Eggleston, D.E. Miller and D. Weinstein, Philosophical Quarterly (2012) 62(247): 429-432. Mill's Utilitarianism. H. West, British Journal for the History of Philosophy (2009) 17(4): 888-889.